DOUBLE BATHROOM VANITY – The idea of having two sinks or also known as the double bathroom has been a trend. Some people sometimes need bigger space in their bathroom in case their family, relatives, or friends visit them. It might be a bit frantic with only one sink to share, and if there is more space, two sinks are more efficient than one. It saves time and with extra amenities, life becomes easier. 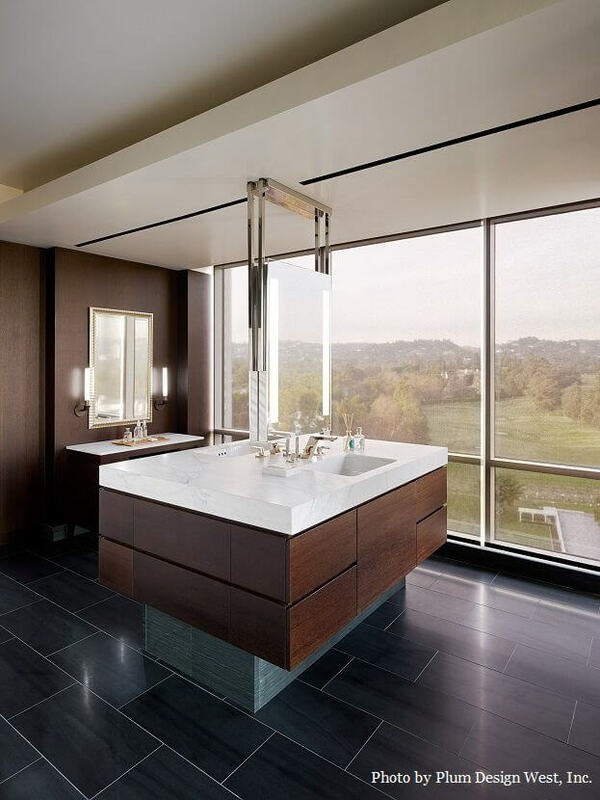 With bathroom vanity design in minds, we got a list of 10 double bathroom vanity design ideas in 2019 that can help you to find your ideal double bathroom vanity design. Designed for a house in Los Cabos, Mexico, architect Olson Kundig designed the master bath vanity with wooden brown as the main colour. He also added a Caesarstone counter and Kallista sink fittings to make the bathroom look modern and minimalist while the pendant lights are designed by Bega. 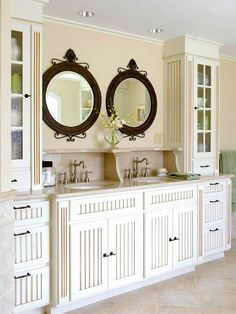 Cottage convenience is a double bathroom vanity design ideas that are focusing on storage. It has an additional cabinet that could store more toiletries as well as more spaces for the towel. The cabinets are designed with accessories and natural colour of white and ivory that makes the design look homey and classic. Furnishing your bathroom with luxurious spa amenities will make you feel ready for the day and won’t think of it as a chore. A thick slab of wooden countertop of travertine completes all this master bath looks and defines the double vanity bathroom. The walls and floors are using the same stone to create a calm, unified atmosphere. 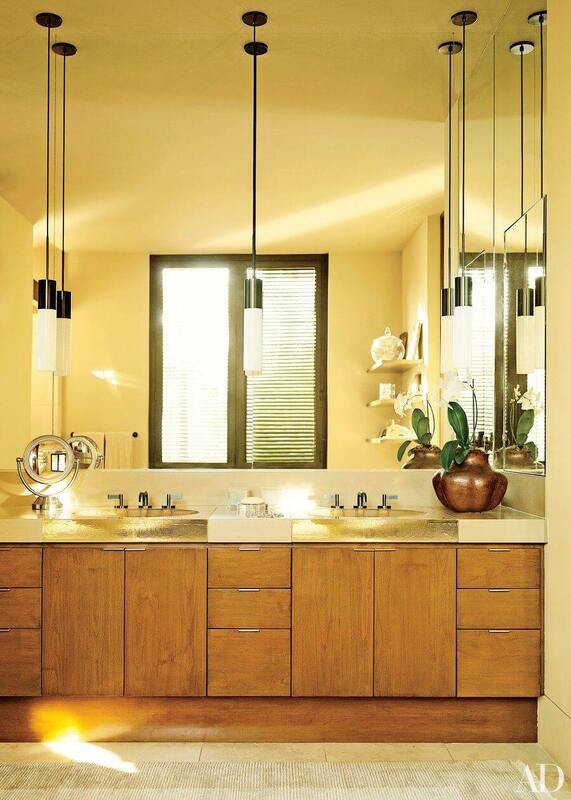 The mount nickel faucets on the modern wall put an artistic element while the mirror-framed mirrors add the space a hint of sophistication and contrast with the exposed-wood ceiling beams. Designed with a dark-wood colour, this vanity gives a rich mature tone to the usual neutral bathroom. This custom-made vanity is very simple with only two drawers and a single shelf for its storage. There is also an open bottom that allows you to see the subway tile of the wall and a little view of the plumbing. The design was made to make the bathroom feel bigger and spacious even with the dual sinks in a small bathroom. Addition of limestone is featured at the countertop to complete the dark vanity looks. Having a problem with small spaces with your bathroom but want to add more sink? 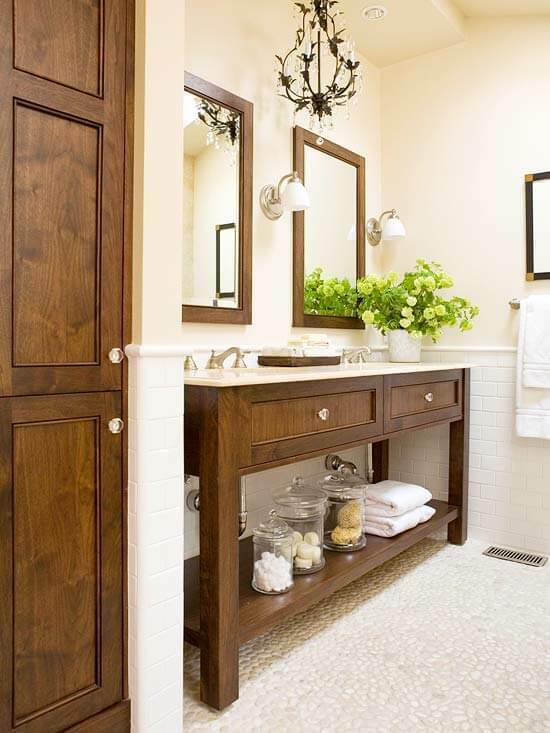 If you do, then this double bathroom vanity design idea is a good choice. By using an antique table and turned it into a rustic vanity, adding a classic porcelain vessel sinks and bridge faucets could give your bathroom a whole new look! To add more vanity storage you can also put a large wooden basket below the tables for toiletries and towels. If you want to add more storage you can put the toiletries in baskets or bins that can sit behind cabinet doors or out in the open. You can also simply slide a basket forward or pull it out to grab what you need. To make it efficient storage, put a group of similar items together, such as cosmetics or hair products. Different and aesthetic are two words you can say when you describe this design. 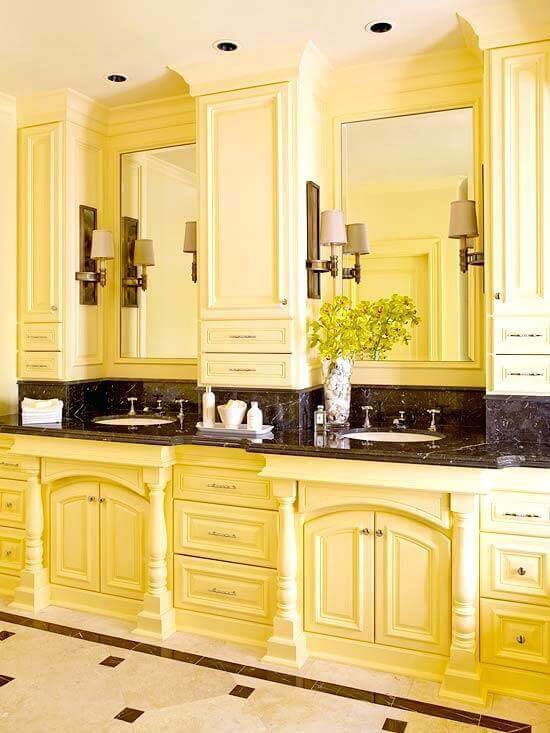 With a distinctive buttery yellow colour, the vanity cabinets designed with a raised-panel pair of doors and its turned legs that make it very exclusive and belong to a five-star hotel building guest bathroom. The double vanities even boast a hotel-style amenity by putting a coffee station in the upper middle cabinet. It also has an addition of countertop space and storage for toiletries and towels. You can also find another luxurious touch on the vanity top and backsplash as the rich veined black stone put on it. Worried your space is not big enough to have a double vanity? No worries, instead of doing it side-by-side, you can put the vanity face to face like how plum design west made their bathroom with a new perspective. 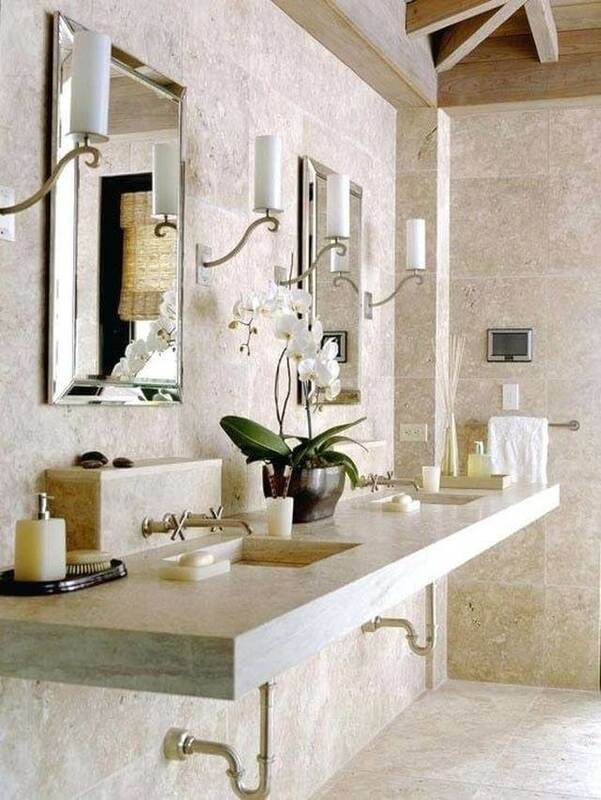 If you have bigger space, you can put the vanity in the middle of the room instead of the usual along the wall. 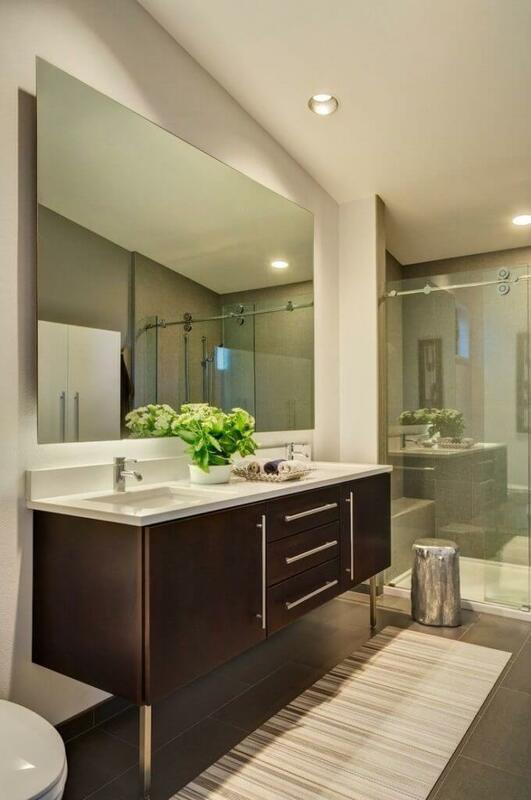 This design is super modern featuring some drawers that can be maintained with the angular look, the mirror is pretty open to each side as well as the addition of ceiling-height windows to add an exotic feel to it. This double vanity design was designed by Abbott Moon via DecorPad offers you a gorgeous chocolate brown tiled floor as well as classic looking vanity with the same colour. The double vanity gives space on the bottom which pulls a contrasting style with the wall colour of white. The frameless mirror also made to make the contrast between the lower and upper part of the room. It is a simply elegant and classic style that will never get eaten by the time. 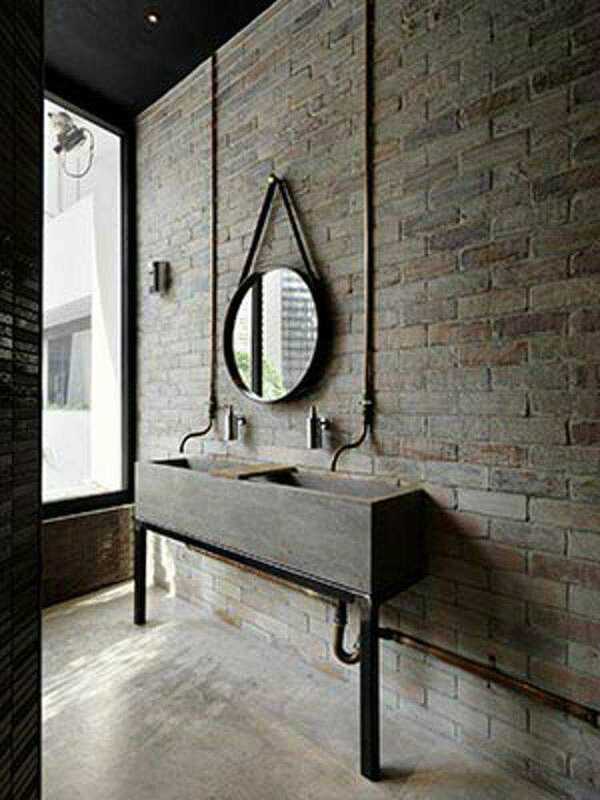 This double vanity design bathroom is pretty hard to pin down but nevertheless still one of the best unique double bathroom vanity design idea. 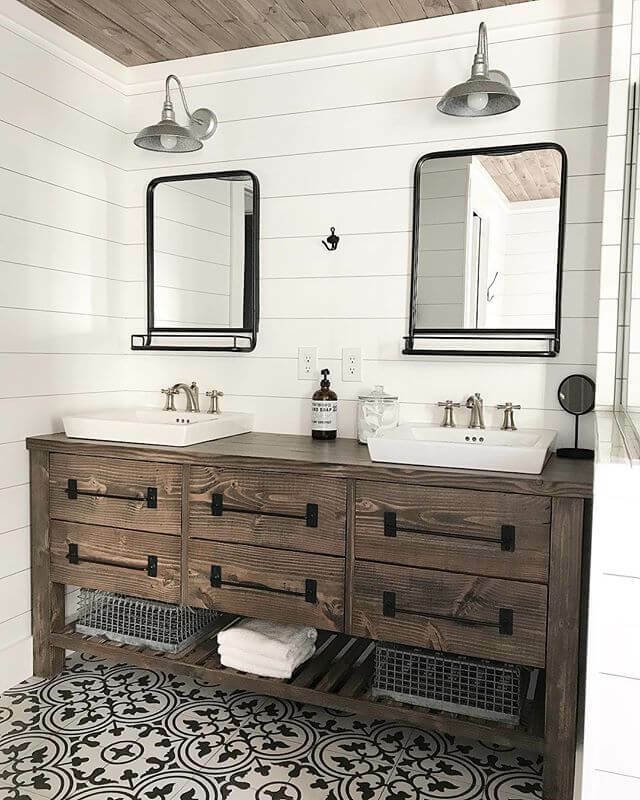 With shiplap wall and metallic taupe double vanity, this bathroom trying to put a contrast between the cold industrial material with the warm colour of wood, pebbles and wicker. A great example of maximizing the rest of the space, having a separate vanity might work. A bathroom designed by Redbud Construction Services, via Houzz, shows you that a proper space put on a room could make a big difference that will surprisingly add your more storage and pulls off a proper homey looks to the bathroom. That is the top 10 of double bathroom vanity design ideas in 2019. 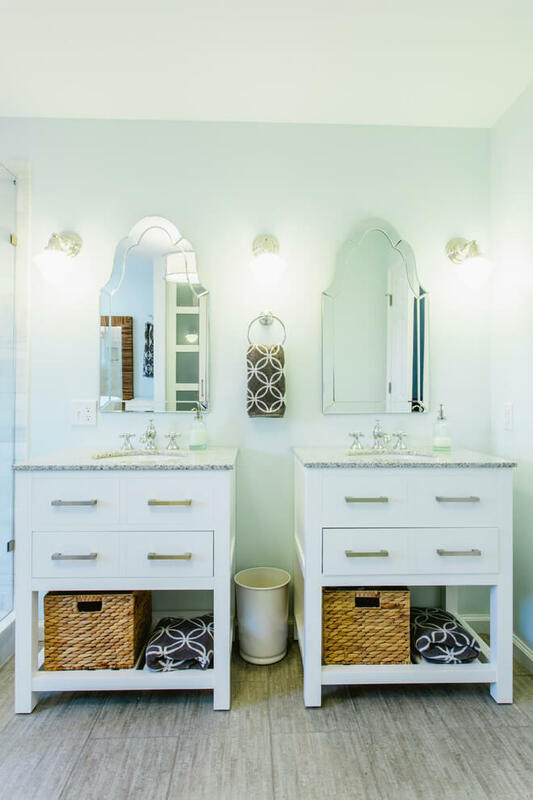 Did you find your ideal double bathroom vanity? If you do, start planning your design and don’t forget to check another post from our website to see more amazing design ideas for your housing lifestyle.